You can now share projects between Apple's two music editing apps. Apple has made its music editing software more robust. On Wednesday, Apple updated GarageBand for iOS and Pro Logic X for macOS, giving users the ability to share projects between the two music editing apps via iCloud File Sharing. This means that users can record music and share the recordings over the cloud to be edited in either app. Previously, you could import GarageBand recordings into Logic Pro X, but not vice versa. GarageBand has been designed to be more consumer-friendly, whereas Logic Pro X caters to the pro level. In addition, GarageBand 2.2 for iOS got a redesigned sound browser, multi-take recording, and advanced studio effects like distortion and pitch correction. GarageBand now also has the Alchemy software synthesizer that was previously available on Logic Pro X. As for Logic Pro X, the 10.3 update gives new MacBook Pro owners the ability to use the Touch Bar. 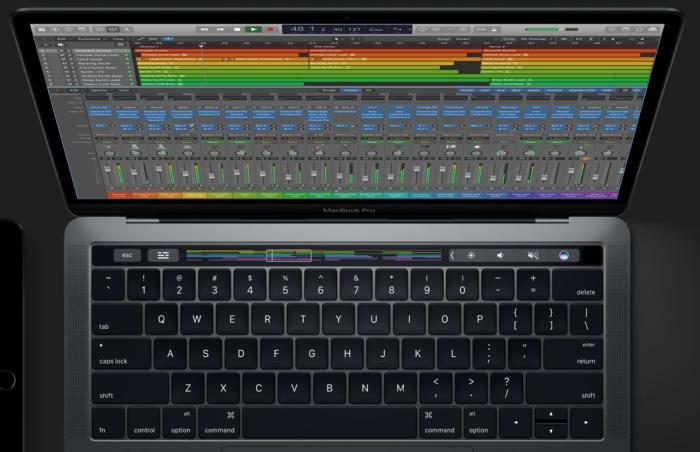 Launching Logic Pro X will activate the Touch Bar, so that you’re able to view projects in a timeline, as well as tinker with a music track by changing the volume, adjusting the controls, and selecting different software instruments. These new software updates are free for existing users. Logic Pro X for Mac costs $200 and GarageBand is $5, although it comes pre-installed on the latest iOS devices. Why this matters: GarageBand on iOS and Logic Pro X for macOS started out by catering to different types of users—consumer versus pro. But with this new update that enables iCloud File Sharing between the two, Apple is hoping that GarageBand could give Logic Pro X users a mobile-friendly way for on-the-go editing.